An adhesive composition includes a polymerizable adhesive monomer and at least one dual function stabilizer. The stabilizer provides superior stabilization and shelf-life of the composition, and enhances wound healing properties of the monomer composition. The dual function stabilizer according to the present invention can be selected from among a range of materials that provide the desired stabilization and wound healing properties. For example, the dual function stabilizer can be selected from herbal extracts, alpha- and beta-C 1-C30 hydroxycarboxylic acids, ceramides, anti-inflammatories, vasoconstrictors, and mixtures thereof. According to other embodiments of the present invention, the dual function stabilizer can be a selected alpha- or beta-hydroxycarboxylic acid, such as alpha- and beta-hydroxycarboxylic acids ranging from C 2-C30. The beta-hydroxycarboxylic acids are primarily exemplified by salicylic acid and C1-C30 ester and salt derivatives. Examples of suitable alpha-hydroxycarboxylic acids include but are not limited to: alpha hydroxy acetic acid (glycolic acid), alpha hydroxybenzeneacetic acid (mandelic acid), alpha hydroxypropionic acid (lactic acid), alpha hydroxybutanoic acid, alpha hydroxyhexanoic acid, alpha hydroxyoctanoic acid (alpha hydroxycaprylic acid), alpha hydroxynonanoic acid, alpha hydroxydecanoic acid, alpha hydroxyundecanoic acid, alpha hydroxydodecanoic acid (alpha hydroxylauric acid), alpha hydroxytetradecanoic acid, alpha hydrocyhexadecanoic acid, alpha hydroxyoctadecanoic acid, alpha hydroxyoctaeicosanoic acid, dicarboxylic alpha hydroxy acids, dihydroxybutanedioic acid (tartaric acid), 2-hydroxybutanedioic acid (malic acid), 2-hydroxy propanedioic acid, 2-hydroxy hexanedioic acid, 2-hydroxy octanedioic acid, 2-hydroxy decanedioic acid, 2-hydroxy dodecanedioic acid, 2-hydroxy myristicdioic acid, 2-hydroxy palmiticdioic acid, tricarboxylic alpha hydroxy acid, 2-hydroxy-1,2,3,-propanetricarboxylic acid (citric acid), 1-hydroxy-1,2,3-propanetricarboxylic acid (isocitric acid) and mixtures thereof. C 1-C30 esters and salts of alpha- and beta-hydroxycarboxylic acids (e.g. potassium, sodium, ammonium, triethanolammonium and the like salts) are also meant to be included within the term “alpha- and beta-hydroxycarboxylic acid.” Depending on the pH of the composition, a mixture of the salt and the acid may be present. Sterilization of the monomer composition and/or its packaging can be accomplished by techniques known to one of ordinary skill in the art, and is preferably accomplished by methods including, but not limited to, chemical, physical, and/or irradiation methods. Examples of chemical methods include, but are not limited to, exposure to ethylene oxide or hydrogen peroxide vapor. Examples of physical methods include, but are not limited to, sterilization by heat (dry or moist) or retort canning. Examples of irradiation methods include, but are not limited to, gamma irradiation, electron beam irradiation, and microwave irradiation. A preferred method is electron beam irradiation, as described in U.S. Pat. No. 6,143,805, the entire disclosure of which is incorporated herein by reference, as well as gamma irradiation. The composition must show low levels of toxicity to living tissue during its useful life. In preferred embodiments of the present invention, the composition is sterilized to provide a Sterility Assurance Level (SAL) of at least 10 −3. In embodiments, the Sterility Assurance Level may be at least 10−4, or may be at least 10−5, or may be at least 10−6. wherein R 1 and R2 are, independently H, a straight, branched or cyclic alkyl, or are combined together in a cyclic alkyl group, and R3 is a straight, branched or cyclic alkyl group. Preferably, R1is H or a C1, C2 or C3 alkyl group, such as methyl or ethyl; R2 is H or a C1, C2 or C3 alkyl group, such as methyl or ethyl; and R3 is a C1-C16 alkyl group, more preferably a C1-C10 alkyl group, such as methyl, ethyl, propyl, butyl, pentyl, hexyl, heptyl, octyl, nonyl or decyl, and even more preferably a C2, C3 or C4 alkyl group. Such alkyl ester cyanoacrylates and other suitable monomers are disclosed in, for example, U.S. patent application Ser. Nos. 09/630,437, filed Aug. 2, 2000, and 09/919,877, filed Aug. 2, 2001, the entire disclosures of which are incorporated herein by reference. Suitable antioxidant stabilizer can be selected from among known antioxidants, including, but not limited to, vitamin E (C 29H50O2) (including alpha-tocopherol (C29H50O2), beta-tocopherol (C28H48O2), gamma-tocopherol (C28H48O2) and delta-tocopherol (C27H46O2) and derivatives thereof, vitamin K (including phylloquinone (C31H46O2), menaquinone (e.g. menaquinone 4 (C31H40 O2)), and menadione (C11H8O2) and derivatives thereof, including but not limited to vitamin K1, chromanol and vitamin K1 chromenol, vitamin C (ascorbic acid (C6H8O6)) and derivatives thereof, pentamethyl chromanol (C14H20O2), non-phenolic antioxidants, octyl gallate (C14H20O5) and pentamethyl benzofuranol (C13H18O2). A preferred vitamin E antioxidant is any of the series of IRGANOX® brand vitamin E (available from Ciba Specialty Chemical Co.). A preferred pentamethyl chromanol is 2,2,5,7,8-pentamethyl-6-chromanol. Derivatives of the described compounds, particularly where the moieties are benzopyranols or benzofuranols, are also suitable. where R 1, R2, R3, R4, and R5 are independently selected from hydrogen, substituted alkyl or unsubstituted alkyl groups having from, for example, 1 to about 20 carbon atoms. Furthermore, suitable compounds include those of the above formula where R2 and R3, and/or R4 and R5, may optionally form cyclic groups having from about 2 to about 40 carbon atoms, preferably from about 2 or about 3 to about 6 or about 8 carbon atoms. In embodiments of the present invention, the composition and/or its applicator may contain materials such as a polymerization initiator, accelerator, rate-modifier, and/or cross-linking agent for initiating polymerization and/or cross-linking of the polymerizable monomer material. Suitable materials and applicators and packaging systems are disclosed in U.S. Pat. No. 5,928,611 and U.S. patent application Ser. Nos. 09/430,177, 09/430,176, 09/430,289, 09/430,290, and 09/430,180 filed Oct. 29, 1999; 09/343,914 filed Jun. 30, 1999; 09/385,030 filed Aug. 30, 1999; and 09/176,889 filed Oct. 22, 1998; the entire disclosures of which are incorporated herein by reference. at least one stabilizer selected from the group consisting of herbal extracts, alpha- and beta- hydroxycarboxylic acids and salts thereof, ceramides, anti-inflammatories, vasoconstrictors, and mixtures thereof. 2. The composition of claim 1, wherein said stabilizer is an herbal extract. 3. The composition of claim 2, wherein said herbal extract is an oil-soluble herbal extract. 4. The composition of claim 3, wherein said herbal extract is selected from the group consisting of chamomile, carrot root, echinacea purpurea, fennel, ginseng, grape seed, grape skin, grapefruit, guggalipids, harpogophytum, jasmine, marjoram, myrrh gum resin, onion, pine bark, red clover flower, resveratrol, rosemary, sesame, St. Johns wort, thyme, Uva Ursi (bearberry), borage seed oil, wild borage seed oil, hesperedin, quercetin, kaempherol, genistein, coumestrol, estriol, phytosterols, limonene, ethoxyquin, hydroquinone, ubiquinone (coenzyme Q), lipoic acid, N-acetyl cysteine, curcumin, basil leaf, bell pepper, dandelion root, date palm fruit, licorice, tomato, myricetin, derivatives thereof, and mixtures thereof. 5. The composition of claim 3, wherein said herbal extract is selected from the group consisting of chamomile, carrot root, echinacea purpurea, fennel, ginseng, grape seed, grape skin, grapefruit, guggalipids, harpogophytum, jasmine, marjoram, myrrh gum resin, onion, pine bark, red clover flower, resveratrol, rosemary, sesame, St. Johns wort, thyme, Uva Ursi (bearberry), borage seed oil, wild borage seed oil, hesperedin, quercetin, kaempherol, genistein, coumestrol, estriol, phytosterols, limonene, ethoxyquin, hydroquinone, ubiquinone (coenzyme Q), lipoic acid, N-acetyl cysteine, curcumin, derivatives thereof, and mixtures thereof. 6. The composition of claim 3, wherein said herbal extract is selected from the group consisting of dill, horseradish, oats, neem, beet, broccoli, tea, pumpkin, soybean, barley, walnut, flax, ginseng, poppy, avocado, pea, sesame, dandelion, wheat, nettle, cashew, pineapple, apple, asparagus, Brazilnut, chickpea, grapefruit, orange, cucumber, buckwheat, strawberry, ginko, tomato, blueberry, cowpea, grape extracts, ivy horse chestnut, centella asiatica, rosmarinic acid, glycyrrizinate derivatives, alpha bisabolol, azulene, asiaticoside, sericoside, ruscogenin, escin, escolin, betulinic acid, catechin, derivatives thereof, and mixtures thereof. 7. The composition of claim 1, wherein said stabilizer is curcumin or a curcumin derivative. 8. The composition of claim 7, wherein said stabilizer is selected from the group consisting of curcumin, demethoxycurcumin, bisdemethoxycurcumin, tetrahydrocurcumin, tetrahydrodemethoxycurcumin, tetrahydrobisdemethoxycurcumin, other curcumin metabolites, (4-hydroxy-3-methoxycinnamoyl)methane, bis(4-hydroxycinnamoyl)methane, hexahydrocurcumin, octahydrocurcumin, and mixtures thereof. 9. The composition of claim 1, wherein said stabilizer is an alpha- or beta-C1-C30 hydroxycarboxylic acid or salt thereof. 10. The composition of claim 9, wherein said stabilizer is selected from the group consisting of alpha- and beta-C1-C30 hydroxycarboxylic acids and salts thereof. 11. The composition of claim 9, wherein said stabilizer is selected from the group consisting of salicylic acid, alpha hydroxy acetic acid, alpha hydroxybenzeneacetic acid, alpha hydroxypropionic acid, alpha hydroxybutanoic acid, alpha hydroxyhexanoic acid, alpha hydroxyoctanoic acid, alpha hydroxynonanoic acid, alpha hydroxydecanoic acid, alpha hydroxyundecanoic acid, alpha hydroxydodecanoic acid, alpha hydroxytetradecanoic acid, alpha hydrocyhexadecanoic acid, alpha hydroxyoctadecanoic acid, alpha hydroxyoctaeicosanoic acid, dicarboxylic alpha hydroxy acids, dihydroxybutanedioic acid (tartaric acid), 2-hydroxybutanedioic acid, 2-hydroxy propanedioic acid, 2-hydroxy hexanedioic acid, 2-hydroxy octanedioic acid, 2-hydroxy decanedioic acid, 2-hydroxy dodecanedioic acid, 2-hydroxy myristicdioic acid, 2-hydroxy palmiticdioic acid, tricarboxylic alpha hydroxy acid, 2-hydroxy-1,2,3,-propanetricarboxylic acid, 1-hydroxy-1,2,3-propanetricarboxylic acid, and mixtures thereof. 12. The composition of claim 1, wherein said stabilizer is a ceramide. 13. The composition of claim 12, wherein said ceramide is selected from the group consisting of Ceramide 1, Ceramide 3, Ceramide 6, and mixtures thereof. 14. The composition of claim 1, wherein said stabilizer is an anti-inflammatory. 15. The composition of claim 14, wherein said anti-inflammatory is selected from the group consisting of beta-methasone 17-acetate, indomethacin, ketoprofen, flufenamic acid, ibuprofen, diclofenace, diflunisal, fenclofenac, naproxen, piroxidam, sulindac, and mixtures thereof. 16. The composition of claim 1, wherein said stabilizer is a vasoconstrictor. 17. The composition of claim 16, wherein said vasoconstrictor is selected from the group consisting of papaverine, yohimbine, visnadin, khellin, bebellin, nicotinate derivatives, and mixtures thereof. 18. The composition of claim 1, wherein said monomer is an α-cyanoacrylate. 19. The composition of claim 1, wherein said monomer is at least one member selected from the group consisting of methyl cyanoacrylate, ethyl cyanoacrylate, n-butyl cyanoacrylate, 2-octyl cyanoacrylate, methoxyethyl cyanoacrylate, ethoxyethyl cyanoacrylate, hexyl cyanoacrylate, dodecyl cyanoacrylate, butyl lactoyl cyanoacrylate, butyl glycoloyl cyanoacrylate, ethyl lactoyl cyanoacrylate, and ethyl glycoloyl cyanoacrylate. 20. The composition of claim 1, wherein said stabilizer is present in said composition in a concentration of from about 0.01 to about 10.0% by weight. 21. The composition of claim 1, wherein said stabilizer is present in said composition in a concentration of from about 0.01 to about 5.0% by weight. 22. The composition of claim 1, wherein said composition has a Sterility Assurance Level of not better than 10−3. 23. The composition of claim 1, wherein said composition is sterilized to a Sterility Assurance Level of at least 10−3. 24. The composition of claim 1, further comprising a non-stabilizer medicament. 25. 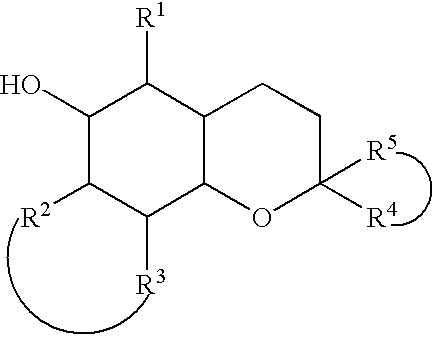 The composition of claim 1, further comprising a plasticizer. 26. The composition of claim 1, wherein said stabilizer is present in an amount sufficient to stabilize said composition during sterilization. 27. The composition of claim 1, wherein said stabilizer is present in an amount sufficient to stabilize said composition during and subsequent to sterilization. 28. The composition of claim 1, wherein said stabilizer is present in an amount effective to provide wound healing when said composition is applied to a tissue surface. 29. The composition of claim 1, wherein said composition further comprises at least one antioxidant stabilizer. 30. The composition of claim 29, wherein said at least one antioxidant stabilizer is selected from the group consisting of vitamin E and derivatives thereof, vitamin K and derivatives thereof, vitamin C, pentamethyl chromanol, non-phenolic antioxidants, octyl gallate, and pentamethylbenzofuranol. 31. The composition of claim 29, wherein said at least one antioxidant stabilizer is pentamethyl chromanol. 32. A method of making the adhesive composition of claim 1, comprising combining the polymerizable 1,1-disubstituted ethylene monomer and the stabilizer. sterilizing the composition in the container. at least one stabilizer selected from the group consisting of herbal extracts, alpha- and beta-hydroxycarboxylic acids and salts thereof, ceramides, anti-inflammatories, vasoconstrictors, and mixtures thereof. 35. The method of claim 34, wherein said sterilizing is by dry heat, gamma irradiation, electron beam irradiation, or microwave irradiation. 36. The method of claim 34, wherein said sterilizing is by electron beam irradiation. 37. The method of claim 34, wherein said sterilizing is by gamma irradiation. 38. The method of claim 34, wherein the sterilized composition has a viscosity less than 150% of a viscosity of said composition prior to sterilizing. 39. The method of claim 34, wherein said stabilizer is an herbal extract. 40. The method of claim 39, wherein said herbal extract is an oil-soluble herbal extract. 41. The method of claim 40, wherein said herbal extract is selected from the group consisting of chamomile, carrot root, echinacea purpurea, fennel, ginseng, grape seed, grape skin, grapefruit, guggalipids, harpogophytum, jasmine, marjoram, myrrh gum resin, onion, pine bark, red clover flower, resveratrol, rosemary, sesame, St. Johns wort, thyme, Uva Ursi (bearberry), borage seed oil, wild borage seed oil, hesperedin, quercetin, kaempherol, genistein, coumestrol, estriol, phytosterols, limonene, ethoxyquin, hydroquinone, ubiquinone (coenzyme Q), lipoic acid, N-acetyl cysteine, curcumin, basil leaf, bell pepper, dandelion root, date palm fruit, licorice, tomato, myricetin, derivatives thereof, and mixtures thereof. 42. The method of claim 40, wherein said herbal extract is selected from the group consisting of chamomile, carrot root, echinacea purpurea, fennel, ginseng, grape seed, grape skin, grapefruit, guggalipids, harpogophytum, jasmine, marjoram, myrrh gum resin, onion, pine bark, red clover flower, resveratrol, rosemary, sesame, St. Johns wort, thyme, Uva Ursi (bearberry), borage seed oil, wild borage seed oil, hesperedin, quercetin, kaempherol, genistein, coumestrol, estriol, phytosterols, limonene, ethoxyquin, hydroquinone, ubiquinone (coenzyme Q), lipoic acid, N-acetyl cysteine, curcumin, derivatives thereof, and mixtures thereof. 43. The method of claim 40, wherein said herbal extract is selected from the group consisting of dill, horseradish, oats, neem, beet, broccoli, tea, pumpkin, soybean, barley, walnut, flax, ginseng, poppy, avocado, pea, sesame, dandelion, wheat, nettle, cashew, pineapple, apple, asparagus, Brazilnut, chickpea, grapefruit, orange, cucumber, buckwheat, strawberry, ginko, tomato, blueberry, cowpea, grape extracts, ivy horse chestnut, centella asiatica, rosmarinic acid, glycyrrizinate derivatives, alpha bisabolol, azulene, asiaticoside, sericoside, ruscogenin, escin, escolin, betulinic acid, catechin, derivatives thereof, and mixtures thereof. 44. The method of claim 34, wherein said stabilizer is curcumin or a curcumin derivative. 45. The method of claim 44, wherein said stabilizer is selected from the group consisting of curcumin, demethoxycurcumin, bisdemethoxycurcumin, tetrahydrocurcumin, tetrahydrodemethoxycurcumin, tetrahydrobisdemethoxycurcumin, other curcumin metabolites, (4-hydroxy-3-methoxycinnamoyl)methane, bis(4-hydroxycinnamoyl)methane, hexahydrocurcumin, octahydrocurcumin, and mixtures thereof. 46. The method of claim 34, wherein said stabilizer is an alpha- or beta-C1-C30 hydroxycarboxylic acid or salt thereof. 47. The method of claim 46, wherein said stabilizer is selected from the group consisting of alpha- and beta-C1-C30 hydroxycarboxylic acids and salts thereof. 48. The method of claim 46, wherein said stabilizer is selected from the group consisting of salicylic acid, alpha hydroxy acetic acid, alpha hydroxybenzeneacetic acid, alpha hydroxypropionic acid, alpha hydroxybutanoic acid, alpha hydroxyhexanoic acid, alpha hydroxyoctanoic acid, alpha hydroxynonanoic acid, alpha hydroxydecanoic acid, alpha hydroxyundecanoic acid, alpha hydroxydodecanoic acid, alpha hydroxytetradecanoic acid, alpha hydrocyhexadecanoic acid, alpha hydroxyoctadecanoic acid, alpha hydroxyoctaeicosanoic acid, dicarboxylic alpha hydroxy acids, dihydroxybutanedioic acid (tartaric acid), 2-hydroxybutanedioic acid, 2-hydroxy propanedioic acid, 2-hydroxy hexanedioic acid, 2-hydroxy octanedioic acid, 2-hydroxy decanedioic acid, 2-hydroxy dodecanedioic acid, 2-hydroxy myristicdioic acid, 2-hydroxy palmiticdioic acid, tricarboxylic alpha hydroxy acid, 2-hydroxy-1,2,3,-propanetricarboxylic acid, 1-hydroxy-1,2,3-propanetricarboxylic acid, and mixtures thereof. 49. The method of claim 34, wherein said stabilizer is a ceramide. 50. The method of claim 49, wherein said ceramide is selected from the group consisting of Ceramide 1, Ceramide 3, Ceramide 6, and mixtures thereof. 51. The method of claim 34, wherein said stabilizer is an anti-inflammatory. 52. The method of claim 51, wherein said anti-inflammatory is selected from the group consisting of beta-methasone 17-acetate, indomethacin, ketoprofen, flufenamic acid, ibuprofen, diclofenace, diflunisal, fenclofenac, naproxen, piroxidam, sulindac, and mixtures thereof. 53. The method of claim 34, wherein said stabilizer is a vasoconstrictor. 54. The method of claim 53, wherein said vasoconstrictor is selected from the group consisting of papaverine, yohimbine, visnadin, khellin, bebellin, nicotinate derivatives, and mixtures thereof. 55. The method of claim 34, wherein said monomer is an α-cyanoacrylate. 56. The method of claim 34, wherein said monomer is at least one member selected from the group consisting of methyl cyanoacrylate, ethyl cyanoacrylate, n-butyl cyanoacrylate, 2-octyl cyanoacrylate, methoxyethyl cyanoacrylate, ethoxyethyl cyanoacrylate, hexyl cyanoacrylate, dodecyl cyanoacrylate, butyl lactoyl cyanoacrylate, butyl glycoloyl cyanoacrylate, ethyl lactoyl cyanoacrylate, and ethyl glycoloyl cyanoacrylate. 57. The method of claim 34, wherein said stabilizer is present in said composition in a concentration of from about 0.01 to about 10.0% by weight. 58. The method of claim 34, wherein said stabilizer is present in said composition in a concentration of from about 0.01 to about 5.0% by weight. 59. The method of claim 34, wherein said composition has a total volume in said container of less than 10 milliliters. 60. The method of claim 34, wherein said composition further comprises at least one antioxidant stabilizer. 61. The method of claim 60, wherein said at least one antioxidant stabilizer is selected from the group consisting of vitamin E and derivatives thereof, vitamin K and derivatives thereof, vitamin C, pentamethyl chromanol, non-phenolic antioxidants, octyl gallate, and pentamethylbenzofuranol. 62. The method of claim 60, wherein said at least one antioxidant stabilizer is pentamethyl chromanol. 63. A sterile composition made by the method of claim 34. 64. A polymerized film made by polymerizing the composition of claim 1.
allowing the monomer to polymerize to form a polymer film. 66. The method of claim 65, wherein said stabilizer is present in said polymer film in an amount effective to promote wound healing. ES2294794T3 (en) 2008-04-01 Compositions effective as monomers wound closure devices. FI77368C (en) 1989-03-10 Adhesion befraemjande Medel, foerfarande Foer Dess framstaellning och som anvaendning daerav adhesionsbefraemjande Medel Foer foerbaettring of tandfyllningars adhesion to the tandben.